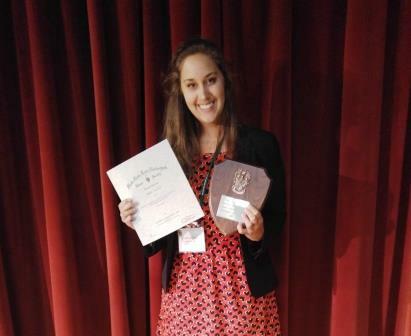 Biology alumna Lindsay Millward (2016) received the first place Frank G. Brooks Award for Excellence in Student Research in Ecology at the Beta Beta Beta Biological Honor Society National Convention in St. Paul, Minnesota in June. Millward’s research was on “Leaf Decomposition Rate Differs Between Invasive Exotic Lonicera maackii and Native Acer saccharum in a Temperate Deciduous Forest” that she completed as part of her senior research project with biology professor Dr. Darlene Panvini. In April, Millward won first place in the regional Tri Beta District II oral presentation session and received an award that paid for her expenses to the national convention. She will begin a Master’s program in ecology this fall at Central Washington University where she received a teaching assistantship.